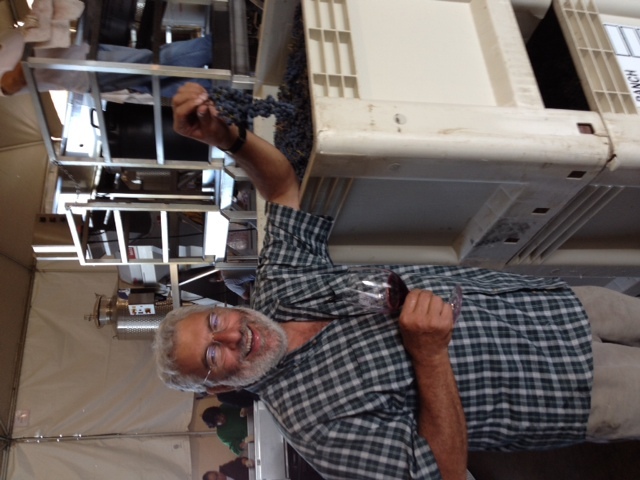 Del Dotto winemaker Gerard Zanzonico had commented on my Facebook when I mentioned I had a short trip planned to Napa. One of the things I like about Gerard, besides his wine, is his affability. He is one of the easiest people to approach and talk to. He is very quick-witted and I’ve never seen him get upset over anything. He rolls with the punches. It was funny to me because the winery tasting, in all its grandeur, is home to him, and he makes it that way for his guests as well. Anyway, he made time for me to stop by right in the middle of harvest. 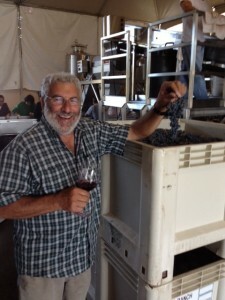 He had jokingly suggested that I help sort grapes…and I took him up on it. Rubber gloves on – check, wedging my tall body between others – check, fanning my fingers over the grapes to pluck out stems and leaves – check, getting the teenager to do it for five minutes – check mate. After that Gerard pulled out a wine glass and prompted me to taste juice straight from the stainless steel tanks, aged from a few weeks to a few months. 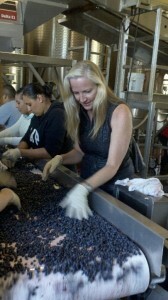 They were so sweet and tangy I could really appreciate what he did to turn it all into wine. We also looked over some of the grapes, and that’s when he jokingly made the remark about grapes being mistletoe for wine lovers. He looked like Bacchus holding a cluster of grapes over his head. I think I might have to try that at home. Once Samantha left, Gerard took me inside the winery for a few tastes of some newer wines I hadn’t had during my earlier visit this past year. I wished I had taken the time for notes but I just didn’t – I recall having a new Howell Mountain, Ca’Nani Vineyard and Villa Del Lago. Loved them all. Oakville Grocery has always been the place to stop to order a sandwich, get some munchies and grab something to drink. Uber-busy all of the time, but worth it. We often took our food to a winery’s picnic area, or, if too hungry, tore into our sandwiches right in the parking lot. 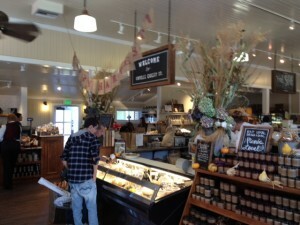 Oakville Grocery – founded in 1881 – is the oldest continually operating grocery store in California. Since it’s opening, Oakville Grocery has been a destination for locals and visitors alike. With our renovation, we have reconnected to our California roots, offering a highly curated selection of the best products from farmers, artisans and purveyors in the Napa and Sonoma Valleys. Local food from local purveyors, since 1881. Teaser: Can you say “FOG?” or “Where is the bridge?” I did. I haven’t been to Napa on a Saturday in years. I like to go midweek and even then I only travel on the Silverado Trail. On this trip, I made my way from 29 to Silverado via Zinfandel Lane. I love that road not only because I’m familiar with it, but because I get a glance at the Shady Oaks Country Inn. It was the first place that I remember staying in with my husband. We loved the warm coziness of it, the daily wine tasting and the hearty Eggs Benedict breakfast we had before setting out for a serious day of winery visits. On this trip, I only used 29 when it was time to leave. But driving out of Calistoga at 5 a.m. to get to the Oakland airport was an experience I hope to never duplicate. My teen, asleep in the seat next to me, couldn’t help me navigate through the FOG. I tried to tailgate the few other cars but they took off on me. Here I had figured I’d be able to at least SEE all of the wineries that I hadn’t had time to visit, but it was impossible. By the time I got to the bridge in Oakland I was so freaked out that I stayed in the center lane as I was driving through the clouds. Or so I thought. Next time, Ed drives, we go during the week, we visit the same places and many more. 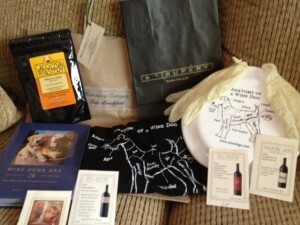 But, it was an experience, as is always the case in a trip to wine country.